The best way to get to know a community is by scheduling a tour. 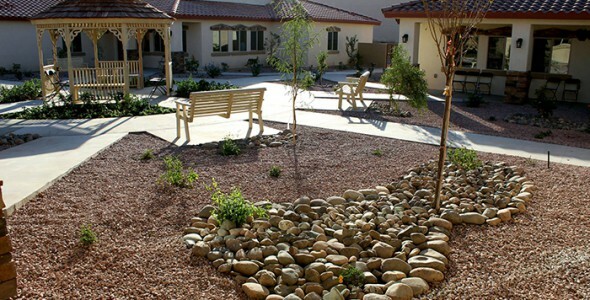 See the facilities, meet the staff and residents, and get a feel first hand what it's like to live at Carlton Village Senior Care Community Assisted Living. Our wide sidewalks encourage activity and social interaction, with shady benches throughout our property to offer a chance to sit and take in the scenery. Our large central pavilion is used often for musical performances, open air markets, and special celebrations. Everything has been built with safety and security in mind. Our facilities are fully gated for secure freedom throughout the complex. Sprinklers and fire resistant doors are installed throughout, and our staff has been thoroughly trained for any situation. Our experienced and caring staff have been trained to not only provide the best care possible but to also offer respect and dignity to our residents. Each resident has his or her own private room, a private bath, and a common area that is staffed 24 hours a day, 7 days a week, by a trained professional. Call button pendants are also issued to every resident for immediate assistance and support. Residents have access to a variety of services. Concierge services to and from medical appointments are provided, as well as an onsite beauty salon and barber shop. Laundry and housekeeping services are also provided daily. Special activities and events will be provided every day for our residents including low-impact sports, live music, open-air markets, and many other offerings. Our chef has many years of experience in preparing meals that are nutritional, delicious, and meet the needs of our residents. Thank you for your interest in Carlton Village Senior Care Community. Please give us a call to schedule a free tour.